A new train station in Hillmorton to serve the expansion of Rugby has been given the green light by the county council. 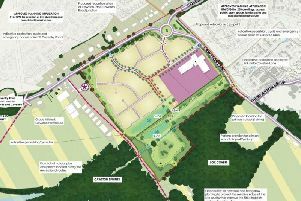 Warwickshire councillors voted last Thursday in favour of building the Rugby Parkway Station on the A428-Crick Road, on land between existing housing and the Daventry International Rail Freight Terminal (DIRFT). The new station will provide a service of two trains per hour (potentially three depending on various factors), allowing direct fast and semi-fast routes to Birmingham, Northampton, the West Midlands, London and the rest of the UK. There will also be a 260- space car park, northbound and southbound platforms with a connecting footbridge, a car and bus drop-off point, and a highway connection on to Crick Road. The scheme will cost nearly £11 million and work will begin in May 2018, with a completion date of December 2019. The station will serve the old mast site, where 6,200 homes are being built over a 15-20 year period. This development could add 15,000 people to Rugby’s population. Rugby Parkway Station will be located on the Northampton Loop of the West Coast Main Line and it is hoped it will be used by commuters to DIRFT and by mast site residents to get into Rugby town centre. It would take four minutes to get from Rugby Parkway to Rugby Station. The new station will also be used as a ‘park and ride’ facility for people wishing to travel to Birmingham, London and Coventry.